Akbar Khamiso Khan Sindhi Alghoza Music Artist. He belonging to Sindhi family from Tando Muhammad Khan, Hyderabad and he is son of Alghoza Master Ustad Khamiso Khan. He is most popular Sindhi legendary Alghoza Master. He has sung "Sindhi Folk Music Instrumental" in Alghoza with stylish "Sur Sangeet", his Stylish Alghoza is most popular in all over the World. 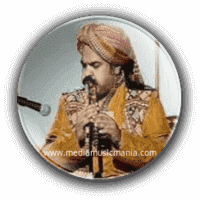 Akbar Khamiso Khan is popular Alghoza Player and he created great name in Sindh Music. Ustad Khamiso Khan father of Akbar Khamiso Khan introduced Alghoza in Sindhi Dhun all over the World, it is a pair of wooden flutes. Sindhi Algoza adopted by Sindhi, Rajasthani and Baloch folk Musicians, also called "Jorhi", "Do Nally, Satara". It resembles a pair of wooden flutes. The musician plays it by using three fingers on each side. It is generally used as a folk instrument and Punjabi folk singers use it to play traditional music such as "Jugni", "Jind Mahi", and "Mirza". He learnt Alghoza fun from his father. Algoza is generally used as a folk instrument in Sindh provinces and Rajhastan India. Akbar Khamiso Khan is true Sindhi Alghozo Nawaz like his father. He sung Kaafi's, Arfana Kalams, Classical Music, in Alghoza. he sung "Dhamal of Lal Shahbaz Qalandar" and Alghoza Jhoomer and also he performed well in foreign countries. I have selected below most Popular Alghoza Music of Akbar Khamiso Khan.